With more and more labels showing Resort collections each year, it means that we have a lot to be excited about. 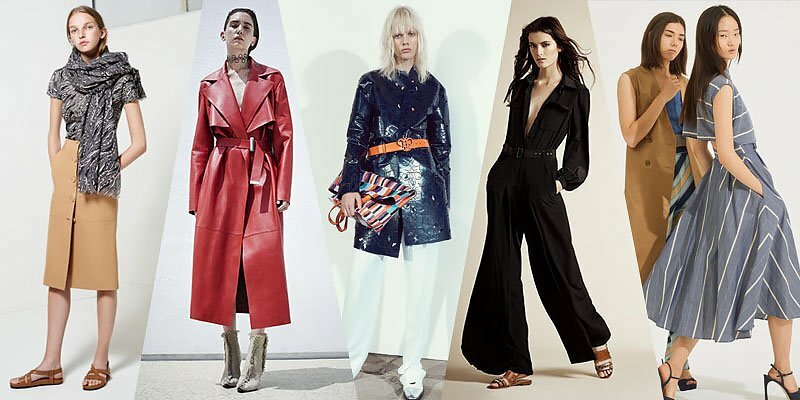 From fresh silhouettes to bold florals and patterns we’ve put together the strongest trends that have emerged from the Resort 2016 collections. Among the biggest Resort trends of 2016 is the jumpsuit trend. Spotted on the collections of Alberta Feretti, Stella McCartney, Topshop Unique and Marchesa, to name but a few. It’s clear that the jumpsuit is going to be the next must-have item in every stylish woman’s wardrobe. Jumpsuits with clean lines and dark or neutral colours, seem to be the favourite among designers, which is great news for fashion lovers because the darker the colour the more flattering it is to wear. Do you want a garment that makes a statement? You will fall in love with the intricate lace or floral jumpsuit pieces as seen at Marchesa. The Oriental influence popped up everywhere on the spring runways and has remained a strong trend which featured prominently in the Resort 2016 Collections, as multiple designers show pieces sporting obi belts. From the beautiful belted jackets at Adam Lippes and Sportsmax, to the statement red leather coat at Acne Studios. This is definitely the most chic way to keep your clothes in place this year! Florals were very bold and bright coming in all shapes and forms. The items ranged from beautiful black and floral pantsuits at Stella McCartney, to the simple but no less gorgeous shift dresses. Florals also dominated the Erdem Resort 2016 runways, and appeared in Topshop Unique collection. From the pretty shirtdresses at Gucci to the geometric garments at Tome, designers have shown us that the midi-hems are a major trend in the Resort 2016 collections. And why wouldn’t we be excited about this? The great thing about the midi hem is that it’s feminine and chic, and it can be particularly flattering if you find the right cut. If you are a tall woman then you can play around with the length, either just above the knee or just below – make sure the hem falls on the slimmest part of your leg as this creates a more slender silhouette. If you’re on the shorter scale then be sure to pick a hem that is slightly above the mid calf. And always add a pair of killer heels to pull the look together! We are loving the beautiful patterns and the multiple colour variations they popped up in the Resort 2016 collections. Prints were spotted on dresses, pants, skirts and jackets and even handbags. From the 60’s and 70’s inspired prints to bold geometric designs, there’s something to suit every style preference. Designers sporting collections with bold brush strokes include the Emilio Pucci, Derek Lam, Etro, Missoni and BCBG Max Azria. Clearly there is plenty to choose from thanks to the incredible Resort 2016 collections this year. Now the question is which trends will you be buying once the collections hit the stores?